More than 40 years ago, John Kennedy wrote in the preface to his book "Today the challenge of political courage looms larger than ever before". In the time that has passes, the world has seen tremendous changes. But these words remain just in our day. As before, an individual needs strength to carry out his responsibility. A nation needs strength to attain and defend its freedom. This strength only comes from courage born of conviction. As a professional economist and recognized banker, I went into politics because I was convinced that my country has the necessary resources and opportunities for prosperity. A patriot of Ukraine, I sought the presidency because I was anguished by poverty, repressed freedom of speech, corruption. An independent Ukrainian state was the result of a battle and great sacrifices of my nation. I could not calmly watch as the hopes of her citizens were replaced by disillusion, as millions of people were forced to look for work abroad, as oligarchic clans stole the national wealth. I made the decision and did not look back, regardless of the threat to my life. I received strength from my family, from my wife Kateryna. I had political partners, some of whom are here today. I had the hopes of my fellow citizens. With every cell of my body, I believed, I felt that millions of honest people believed in me, that we could win and that we would undoubtedly win. In my most difficult moments I remembered by responsibility before them and I continued the fight. I was able to return from a place where few survive, because of their support and prayers. Today, after the victorious Orange Revolution, I cannot separate what I accomplished from what was accomplished by the courageous acts of the Ukrainian people. I am proud, that my nation demonstrated its strength, peacefully and beautifully defended its freedom. I am happy that my fellow citizens subscribe to the great values of democracy. Being chosen to receive this award is a great honor for me. It carries the name of a great man, whose example inspires many people, myself included. We are not only referring to the example of courage in the face of physical pain, which accompanied him in life. 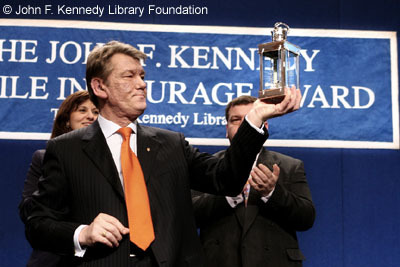 For me, John Kennedy became a symbol of courage and great foresight in politics that are always worthy to follow. He became an example of success to a new generation that entered politics. The Orange Revolution brought a new team to power in Ukraine. These are honest professionals and patriots, not encumbered by the old stereotypes of Soviet times. We and many other Ukrainians today are ready to repeat the words of John Kennedy "Ask not what your country can do for you - ask what you can do for your country". We are led by the same desire to free Ukrainians from poverty and lawlessness, reaffirm justice and the rule of law. We want to make Ukraine one of the leaders of democracy, a flourishing nation among European peoples. We are answering a serious social challenge. And our answer is also founded on the conviction that we do not need to divide the economic pie, but want to enlarge it. We also know that "if free society cannot help the many who are poor, it cannot save the few who are rich". We wish to demonstrate a new model of politics, not one which is founded on public relations or political technologies. We do not want to manipulate the citizens of Ukraine but unite them. I share the view of John Kennedy that politics cannot be just a competition for votes. Despite all external factors, a politician must fulfill his responsibility. Thus, my dear friends, I view this honor as a confirmation in the mutuality of great ideas which today guide America and Ukraine. I also view it as recognition of all Ukrainians who stood up to defend their dignity, democracy and rule of law. These are the values which we profess together with the democratic world and that we are ready to defend. I believe that Ukraine and the United States will defend them together, as strategic partners. The award that I today am honored to receive symbolizes the light of hope. This light is lit by great individuals. It will shine for us and after we are gone. The challenge of President Kennedy always remains with us: to establish the freedom. "All this will not be finished in the first one hundred days. Nor it will be finished in the first thousand days, not even in our lifetime on this planet. But let us begin". These words also continued by another great individual, John Paul II, when he said to Ukrainians and entire world "Do not fear!" We heard these words. We will continue to follow them.